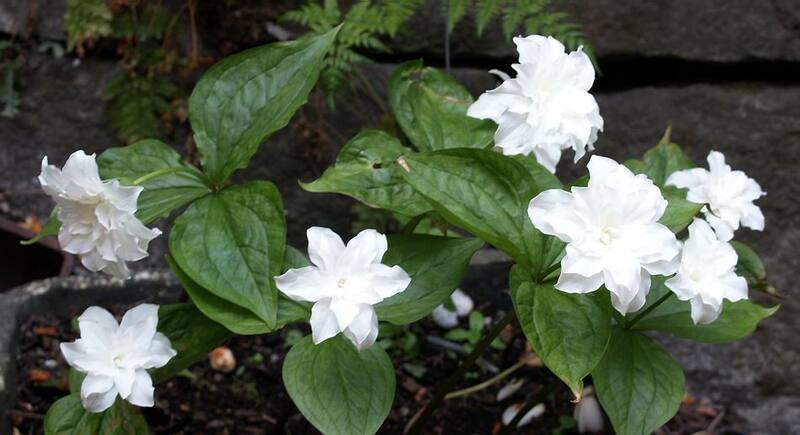 Above are a group of double Trillium grandiflorum growing in a polystyrene box so that I can repot it on a regular basis and speed up the rate of increase. I will be tipping it out in the next few weeks so watch this space. In the garden another form is slow to increase partly due to the intense competition that all plants in our garden have to put up with. I also think that the rate of increase of many of the old clones that are around does slow down as time goes on - this loss of vigour could just be down to the age of the clone or it could be due various harmful pathogens such as disease and latent virus that may show no outward symptoms. and they will flower as normal. 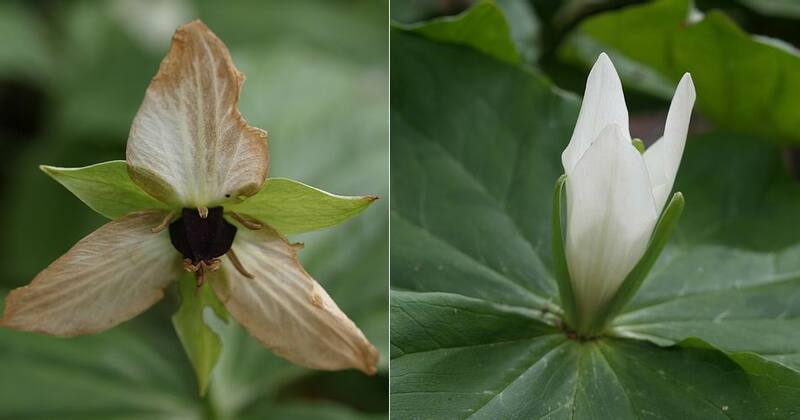 Not all trilliums produce that wonderful colour as they go over some just become brown as they dry out and wither; like T. erectum album, above left, while the flower this white form of T. chloropetalum seems to go on looking fresh for ages. 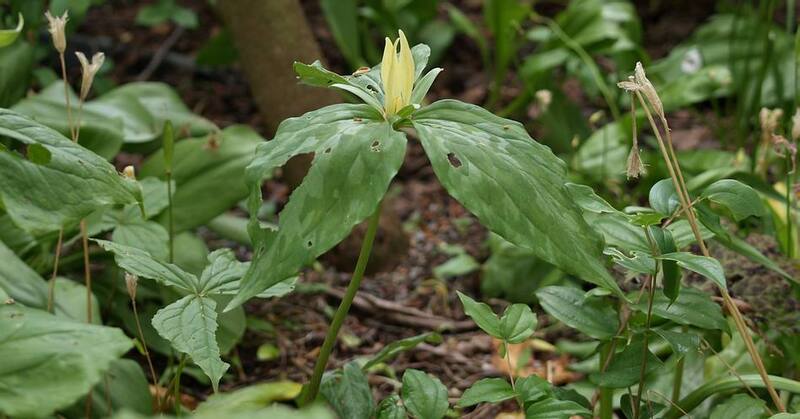 A lone Trillium luteum is still in flower under the large Rhododendrons and just look at how chewed up it is - this is the worst year we have ever had for slugs and snails. I do not normally resort to slug baits and poisons but I am seriously considering it to try and get control of the population explosion. Another casualty to the snails and perhaps the final straw that pushes me into doing something drastic is this superb lily that was felled by some hungry slug. Why can't somebody breed a slug that eats weeds and only weeds? Then we could solve two problems at once. Luckily the snails have not found the tiny Lilium nanum as that would surely disappear as a midnight snack. As I am sure I have said already this has been a very poor year for seeds in our garden and bulb houses - the cold and damp weather when the flowers were out was not conducive to good pollen development. 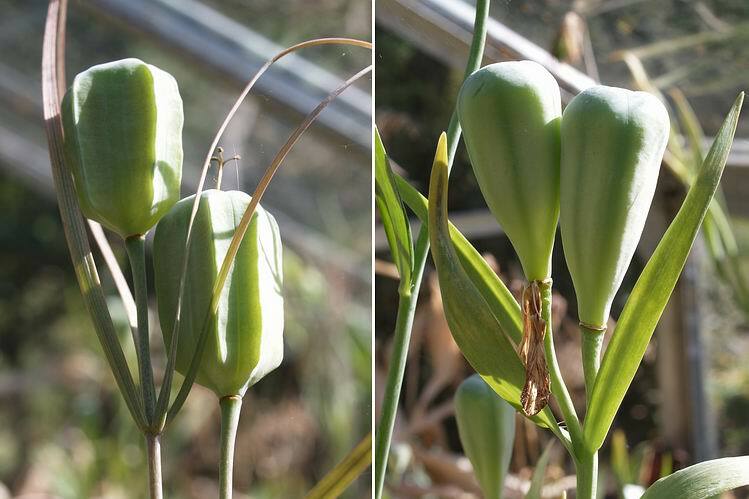 Fritillaria stribrynii above is a typical example where only one flower has been successful in producing a ripe seed pod. 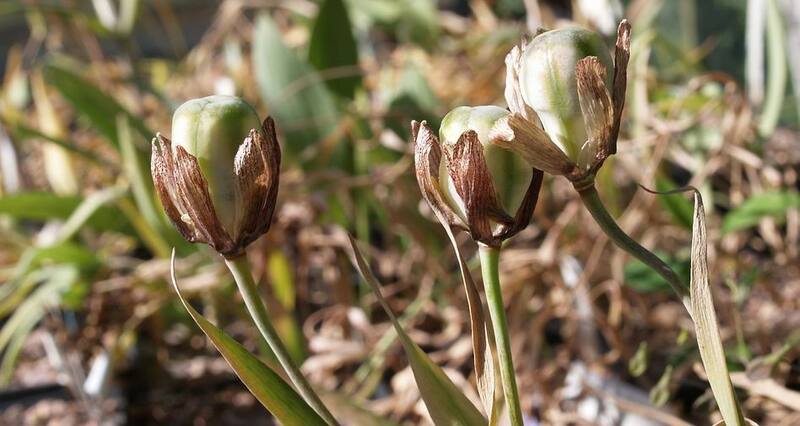 It is interesting to compare the bulbs that have good seed and plot them against the few bright warmer days we had when their flowers were out. 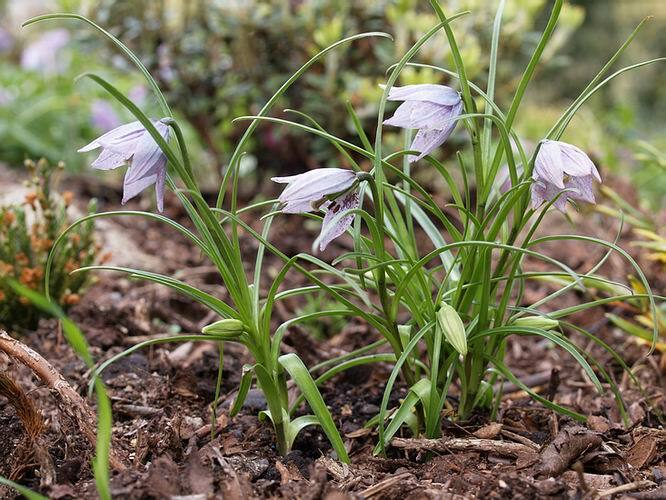 Above is a hybrid of Fritillaria michailovskyi which retains one of the characteristics of that species which is that the old petals do not fall away when they go over like most species but remain attached to the stem as the seed pod ripens. 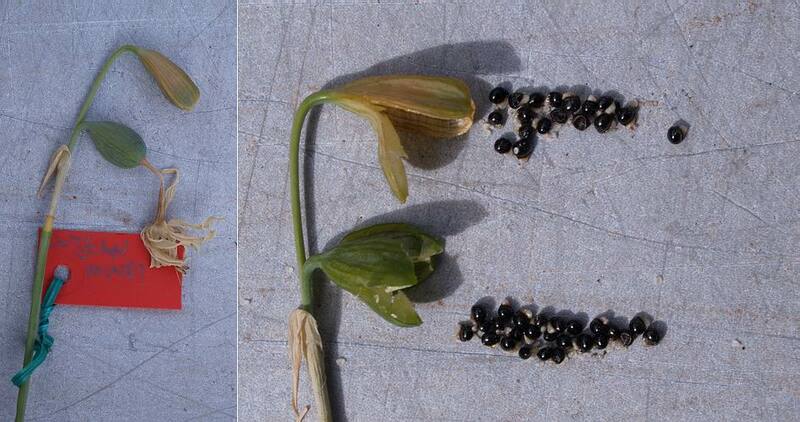 Another couple of Fritillaria seed pods which have swelled full of good seeds - notice the shape of the one on the right. It should be nice and rounded at the base as well as at the top but the pollen tube obviously stopped growing down and as a result the lower ovules were not fertilised so the seeds at the lower end of the capsule will be small and not fertile. 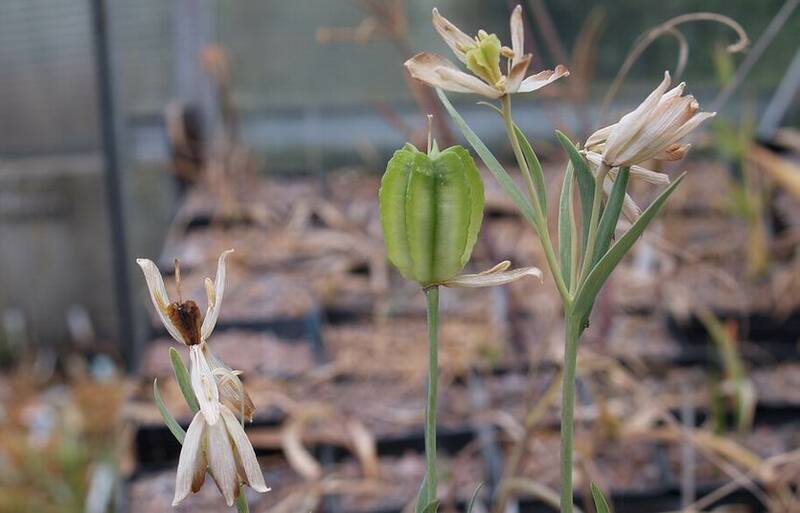 Among the first to flower was Fritillaria pudica and its seed pods are now starting to split so I will collect the seed by cutting the stem and placing them upside down into a paper bag. This bag will then be placed on a shelf in a shady shed where they will remain until September when I will sow them. It is worth while occasionally checking up on seed stored like this to make sure that there are no wee maggots that are eating them. A few other seed pods look promising but just because the pod swells does not mean that you will get good seeds - some pods grow and are just filled with air. Muscari is one of the species that can do this and while I am very hopeful of getting some seeds from Arthur's wee Muscari species I will have to wait a week or so before I can be sure. 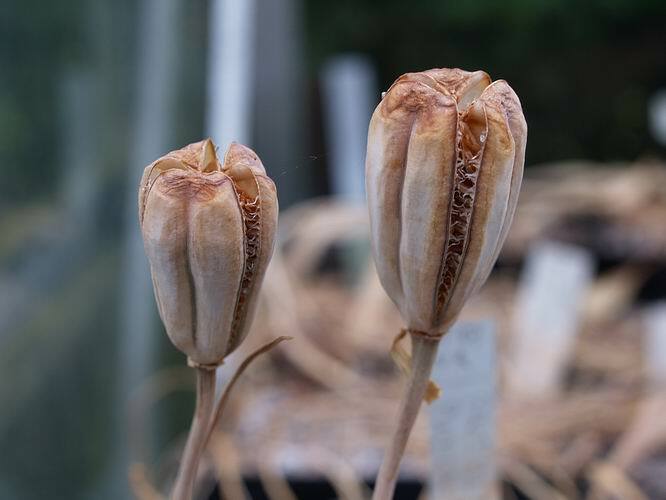 On the other hand some bulbs like this Allium produce dried flower heads which do not look like they have produced any seeds but when you examine them the seed pod is swelling very well and I am sure that I will find seeds in this case. Alliums have evolved this way to aid the distribution of their seeds so that when the seed pods are ripe and open the whole flowers head will break off and tumble about in the wind scattering the seeds over a wide area as they go. Seeds that have evolved to be distributed in this way should be sown on the surface and only covered with a light covering of gravel. 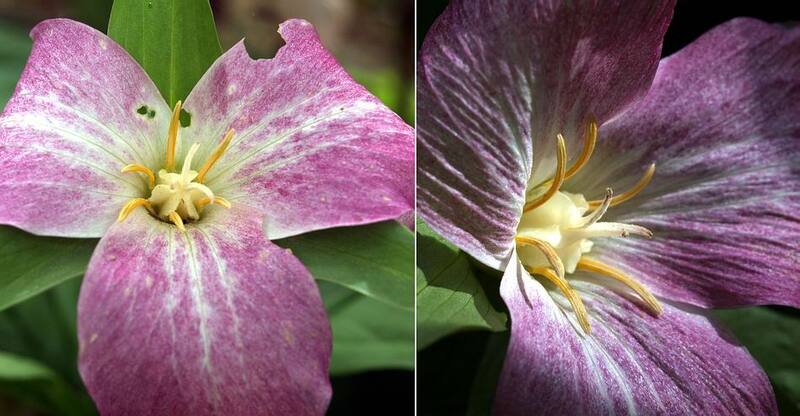 The way a plant has evolved to distribute its seed gives us valuable clues as to how to sow it. 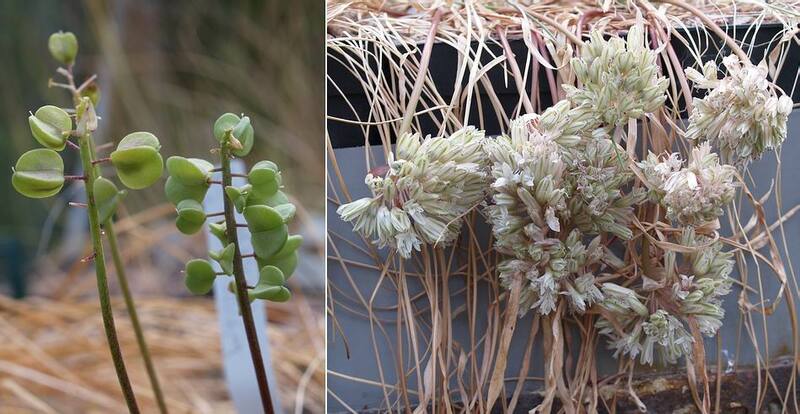 The seeds of both the Tristagma, and Techophilea above have eliasomes, a fleshy attachment, to attract ants and other insects to distribute the ripe seeds. I take this as an indicator to plant the seeds at least half way down the pots and I get excellent results from sowing this way. Nothoscordum, on the other hand, is related to Alliums and so I sow on the surface, only covering it with a layer of gravel. Some logs ago I showed pictures of me cross fertilising my Narcissus triandrus with various other Narcissus species - now it is time to harvest the seed. You can see that the top capsule has turned yellow and has started to split while the second one is still quite green. Do not worry about collecting seeds at this stage as you can see the seeds in the green capsule are all well formed and fully ripe. The seed is ripe before the capsule starts to turn yellow and open. I will only know for certain whether I have been successful in making a hybrid or not when the seeds grow and produce leaves and flowers. 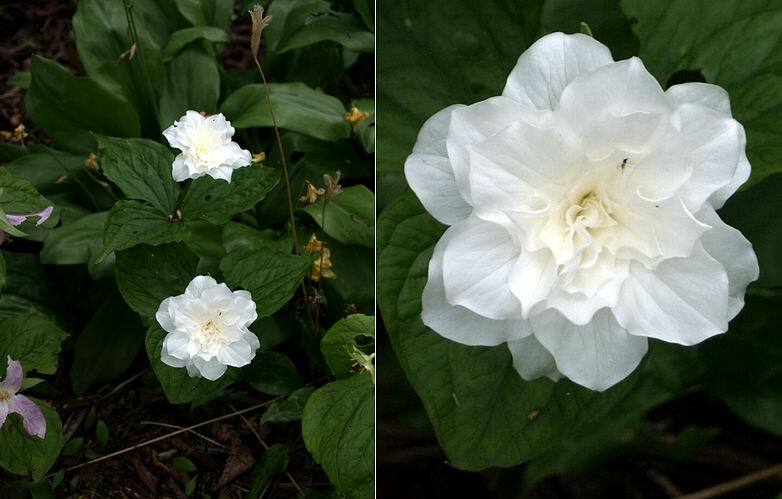 Because I do not remove the stamens from the seed parent nor do I cover the stigma with muslin after I have fertilised it so it is possible that my cross was not successful and the flower has been fertilised in some other way. 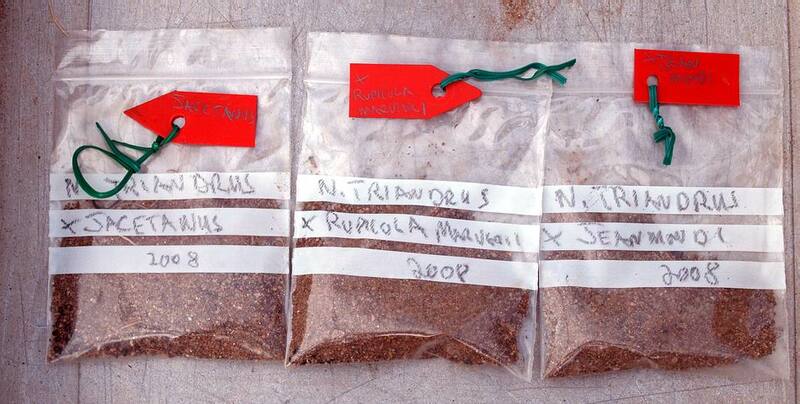 As my trials over many years have shown the best way to store narcissus seeds is to place them in dry sand in a small plastic packet and keep them in the shady shed - not the fridge. I am often asked why I do not imitate nature and just sow the seeds immediately they are ripe and my answer is that I am imitating nature as near as I can. In nature the seeds are shed as the capsule splits but they are generally shed into a warm dry ground, where many will be taken under ground by ants, for a Mediterranean type summer to wait until the autumn rains come - that is exactly what I am doing by storing them in sand. I do not keep them in a fridge because I believe that the seeds continue to ripen after they are shed and placing them in the cold will arrest that continued development and reduce viability. If I had the space under glass I would sow the seeds deeply into pots of dry compost now and then keep them under cover for the summer before placing them outside to take the rains from September. Now we have to wait for about three years to see if I have successfully created any new hybrids from these seeds. 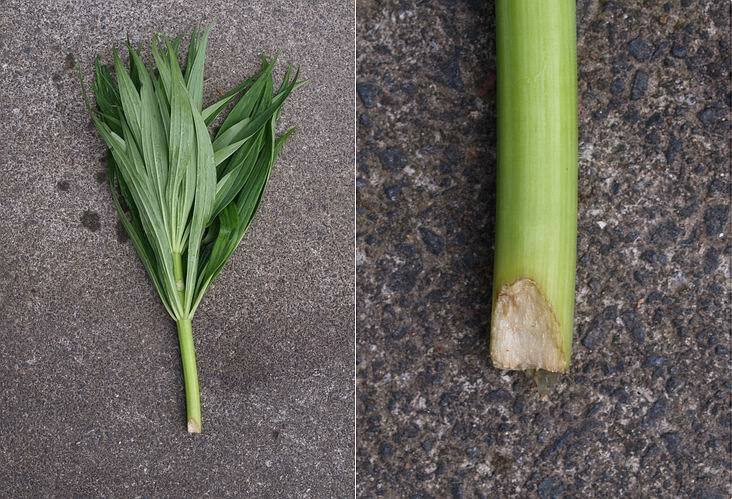 Gardening is all about patience taking the time to observe and understand your plants as well as enjoying their beauty - so does that mean there will have to be another three years of bulb logs?